Singing Barn Swallow. Open wide! When I photograph a bird for the first time I focus initially on just trying to get a good enough image to identify the bird. I have some interest in the nature and biology of wildlife, as well as in photographing it. Then I work on getting the best image I can at that time and in that setting, trying to get closer, picking a better background, moving around the bird until the angle of light is as pleasing as possible. After I’ve captured a nice image I start looking for interesting behavior. Every animal exhibits interesting behaviors. You just have to be patient and spend enough time with them. I guarantee, if you do this you will see some interesting behaviors. 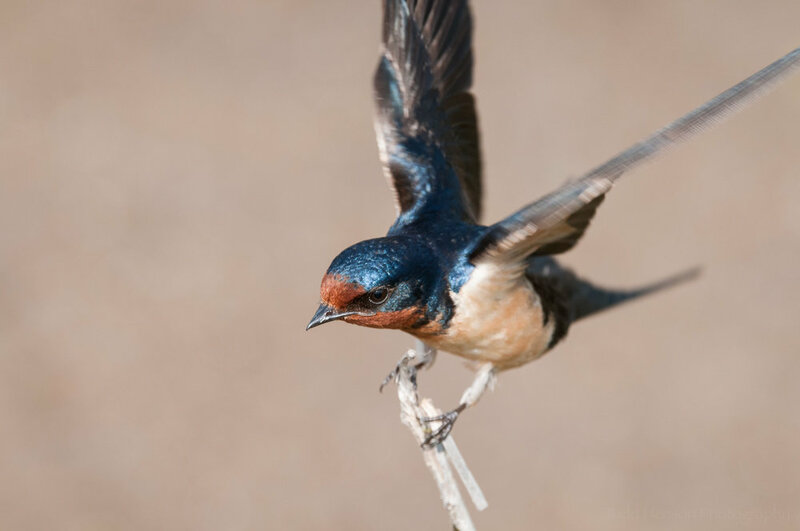 The little barn swallow in these photos was a fantastic subject. Swallows are very interesting birds. They tend to move around a lot, and when flying perform some incredible acrobatics. I often try to photograph these birds in flight, but it’s very difficult. As you can see, I did not manage any flight shots at this setting. Barn Swallow looking this way with head to the right. Notice the forked tail. Barn swallows are also very beautiful birds. They have a metallic blue head, back, and wings that just shine in sunlight. And the front of their face and chest are a gorgeous rust orange tone that gets lighter further down the body. I love their forked tail, another distinct feature of barn swallows. I was lucky to have several convenient perches very close to the boardwalk I was on. And barn swallows in this area are not at all afraid of people, so I was fairly close to this one. It would sometimes take to the air, fly around a bit, then return to one of the perches. I spent almost 10 minutes photographing the bird at this specific perch, and another 30 minutes or more at another perch. You can see a range of behavior in these photos. In one the barn swallow looks straight up to the sky, mouth slightly open. I don’t recall what was in the sky that day. It might have been an osprey or a great blue heron, or perhaps another barn swallow. In other photos the swallow is just looking one way or another. In one it began flapping its wings, but unfortunately I wasn’t prepared for this and ended up cropping the ends of the wings. But I include the photo to show the different behaviors you can see. 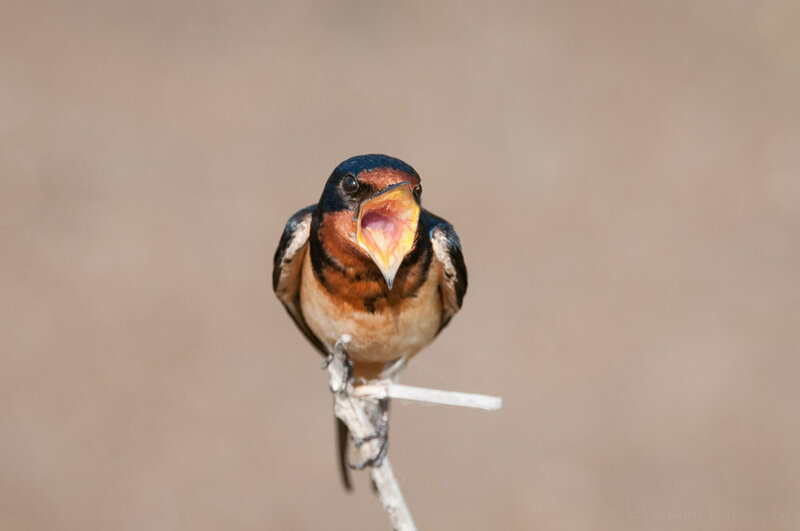 My favorite behavior of the day was when the barn swallow faced me directly and began singing, almost as if it were serenading me. You can see right down its throat. And notice the nice little catch light in the left eye (the bird’s right eye). The sun was behind me, providing front light to the swallow, and allowing the eye to reflect the light of the sun. I often try to position myself similar to this to place a natural catch light in the eye. There’s something about catch lights that really bring a photo to life. Take a look at a few magazines some time, look for catch lights in the eyes of the people or animals in the photos. I bet you’ll see at least a few. Portrait photographers often try to include catch lights in the eyes of their subjects, sometimes placing flashes or strobes for exactly this purpose. I love these little birds for their bright colors, beautiful form, and graceful movements. And I love them for their bold and brave behavior, allowing me to get closer than with many other birds. I hope I’ve been able to pass on a little of my excitement for these wonderful birds. For another example of interesting bird behavior see my post about a stretching female red-winged blackbird.